How Will GST Impact the Technology Landscape in Indian Warehousing? Amidst some confusion and much anticipation, India has finally finalized the blueprint of one of the most important tax reforms that will hit the country on 1st July 2017. The Goods and Services Tax (GST), approved and introduced by the Narendra Modi-led government is likely to have a far-reaching impact. The warehousing space is not likely to escape the change too. The tax reform is likely to have an immediate and a very real impact on the efficiency of the entire supply chain. 65% of India’s logistics is road-based, and given the different tax rates in each state and even municipal regions within states, a lot of time is wasted waiting at borders and checkpoints. An estimate is that as much as 60% of the total journey time is spent idle now. This can be drastically reduced with the unified tax regime GST will bring. Goods are likely to get delivered faster, and therefore cheaper than before. This post is not about that though. This post is how the technology that drives the warehouses will be impacted as this sea change comes about. For years, companies have been creatively using the warehouse to avoid taxes and reduce costs. Earlier, when a company sold its products to a dealer in another state, the products attracted a CST (Central Sales Tax). CST became a recurring cost in the entire supply chain, which sliced the profits of both the company and the dealer. However, if the same path was routed through a warehouse, CST did not come into the picture. Many companies in the country, therefore use the warehouse model to save on taxes. Although they had to spend on buying and maintaining a warehouse in every state when the options were weighed against each other, the former appeared attractive. GST, on the other hand, facilitates a centralized and consolidated tax, without adding any burden on the company.Thus, GST is likely to change the entire landscape of the supply chain primarily because maintaining a warehouse in every state may no longer be needed. In short, the advent of GST is providing the companies with a golden opportunity to completely restructure their warehousing in terms of size, capacity, and location. Here are a few ways how GST will impact the technology landscape in warehousing. Warehouse automation is a costly affair when not done at scale. The earlier warehouse model kept the size of the warehouse small, which made automation more expensive. That being the case, even in the 21st century, many warehouses in India were still labor intensive. However, with the implementation of the GST, the scenario will take a turn towards automation. Mergers, acquisition and space addition geared to increase the size of the warehouse and provide scale will make partial or full automation feasible. Warehouse Management Systems will play a key role in this upcoming transformation. This greater scale will also positively impact the IT cost of deploying WMS and ERP systems. The changed tax reform will empower the newly-large warehouse to deploy WMS to provide the next level of customer service. Since the finalization of the blueprint of GST, large Indian and foreign companies are trying to take the warehousing and supply chain automation to the next level. Mahindra Logistics recently announced its alliance with a global robotic company for its large warehouses. The same is true of CCI Logistics, which is planning to invest a whopping Rs. 250 crore in upgrading their automation processes. The implementation of GST has opened many blocked paths and is likely to take the technology to the next level. A future where drones automatically pick the product from the warehouse and deliver it directly to the customer awaits. The adoption of cutting-edge technology by the large companies has a positive impact all through the cycle – technologies get cheaper as they get mature with adoption. It stands to reason that as the large companies automate, the smaller companies will follow suit in due course. The present tax structure, being complex, had made it that much more difficult to take key decisions regarding stocking, ordering, and delivering. To save on taxes, companies at time stock up inventory and on other occasions run out of inventory when the demand is surging. GST is likely to smooth this curve. Being a uniform tax applicable nationwide removes one variable, that of region-specific tax fluctuations, from the equation. This means companies can focus their forecasting on the variables more directly associated with their business. In today’s big data & analytics-enabled world, these forecasts can be made very accurate. 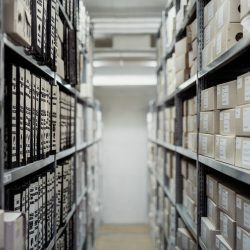 Such enhanced demand forecasting is key in warehousing because it eliminates the cost of over-stocking or under-stocking due to poor forecasting. The WMS solutions can be much more tightly integrated with such forecasting tools and can become much more predictive than reactive as data accumulates. This is an area where uncertainty still prevails. The reporting and compliance needs that GST will bring in have not yet been fully explained but it is fair to expect that these will be onerous with stringent penalties applicable for deviations. The GSTN will likely demand accurate, regular, and comprehensive reporting of all transactions given the complexity of the distribution of the gathered taxes. This being the case the reporting and record-keeping functions of the WMS will have to be of the required standard. Recording should be easy, reporting should be prompt, and retrieving should be hassle-free. This looks set to become a central requirement of the systems of the GST-enabled warehouse. According to the Indian Warehouse Market Report 2016, the warehouse space requirement is expected to increase to 839 million square ft in 2020 from 612 million square ft now. This growth is likely to be further fueled with GST as it will make the warehouse sector more organized and technology-enabled.With GST, the warehouse sector is expected to witness a tectonic shift as well as a technological shift. Will you be ready?